Discovery shuttle commander Mark Polansky (left) and pilot William Oefelein pose for a photo while training for their STS-116 mission. When NASA'sshuttle Discovery launchestoward the InternationalSpace Station (ISS) this week, you can be sure that a self-described Jerseyboy and Alaskan explorer will be at the helm. CommandingDiscovery's STS-116mission to rewire the space station's power grid is veteran shuttle astronautMarkPolansky of Edison, New Jersey. In the pilot's seat next to him will befirst-time spaceflyer WilliamOefelein: Alaska's first orbit-bound astronaut. Ahead ofthem is a challenging 12-day spaceflight to deliver a new pieceof the ISS, activatea primary power and cooling system for the first time, and replacea station crewmember. NASA mission managers have billed STS-116 the mostcomplex shuttle flight to date. "I don'tthink that it's any more or less important to successfully accomplish thismission than it is for any other," Polansky said in an interview, adding that eachISS construction flight depends on its predecessor. "If we don't get therewiring done for the station to get into its normal power grid, it's going tobe hard for any subsequent mission to get done the things they need to do." ForPolansky, it was a chance encounter with Apollo astronauts NeilArmstrong and Eugene Cernan while still a student at Purdue University that sethim on a path to the U.S. Air Force and space. "[I]t gotme thinking, 'You know, this is something that a guy could do,'" Polanksy, who'scall sign is "Roman," said in a NASA interview. Polansky,50, joined NASA's ranks in 1992 as anaerospace engineer and research pilot. By 1996, he was an astronaut and, in 2001, served aspilot during NASA's STS-98mission to deliver the U.S.Destiny laboratory to the ISS. STS-116 will be Polansky's second trip tospace and his first as mission commander. "So it'ssort of like being both a player and a coach at the same time," said Polansky,who is one of only two veteran spaceflyers--spacewalker RobertCurbeam is the other--among the STS-116 crew. 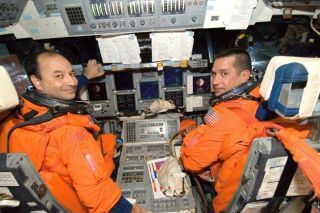 The two shuttleveterans have worked to go over the finer points of orbital life with their crewmates,including basic activities like sleeping and brushing your teeth, Polansky hassaid. The successof NASA's last two shuttle missions, which returnedthe agency's three-orbiter fleet to flight status and resumedISS construction, leave Polansky confident of STS-116's success, but therewill always be risk. "If anybodysays we can take the risk completely out, they're just blowing smoke," he said,adding that he believes the gains of human spaceflight outweigh its hazards. A fan ofice hockey, snow skiing and light aircraft flight, Polansky is married to wifeLisa, with whom he has a daughter, but keeps space in his heart for hishometown. "Sure, I ama Jersey boy," he said in a NASA interview, recalling Edison. "My mom stilllives there." Unlike his shuttlecommander, Oefelein did not see an astronaut career ahead of him while growingup in Anchorage, Alaska. "I neverreally, as a kid, wanted to become an astronaut," Oefelein said in a NASAinterview. "I just wanted to fly airplanes and explore." Oefeleinfirst took to the air on his own flying gliders at age 14, then moved on tofloatplanes and ultimately to the U.S. Navy in 1988, where the now 41-year-old aviatorholds the rank of commander. Oefelein--hiscrewmates call him "Billy O"--joined NASA's astronaut corps in 1998, where hisyouth in Alaska served as an asset. "I guess itgave me an advance in the winter training for sure because I think it was justanother camping trip to me," shuttle pilot told reporters, adding that he neverrealized you could go camping in 80 degree heat because he'd never seen suchdays. "I remember, one time, getting bogged down on a dirt [landing] strip andI had to get out and push the airplane out of the mud. But that's flying inAlaska for you." In additionto his duties as Discovery's pilot, Oefelein will also serve as a coordinatoror sorts for the STS-116 mission's three spacewalkers during their ISS assemblywork. He also served in the Advanced Vehicles Branch of NASA's AstronautOffice, as well as the CAPCOM--or spacecraft communicator--branch, during theeight years as an astronaut, throughout which time his family made manysacrifices. "They werepretty happy," Oefelein said as he recalled telling his family of his STS-116assignment. "It was good news." Oefeleinsaid he is looking forward toward his first spaceflight and applying thelessons he learned while growing up in Alaska. "There's alot of engineering that can come out of working in adverse conditions, and that'sa lot like building a space station," Oefelein said. "The things you can learnout of how to build something in space, that's a skill that you can now takewith you to the Moon and to Mars."